Choose the HP ENVY 4520 all in one printer for lab-quality photos and easy wireless and mobile printing. Accomplish more in less space with the all in one functionality and compact design of this HP color printer. Start printing quickly, without accessing a network with easy setup from your smartphone, tablet, or PC. Print, scan, or copy with the 2.2-inch display, simply touch and go. Print remotely without worries, using the auto-deploying output tray and save paper and conserve resources with automatic two-sided printing. Optional quiet mode minimizes sound disruptions. Highlights: The all in one functionality of the HP color printer includes; print, copy, scan, wireless, remote and Wi-Fi Direct printing. HP Smart app: The HP Smart app puts the power of your printer in the palm of your hand. Highlights: The all in one functionality of the HP color printer includes; print, copy, scan, wireless, remote and Wi-Fi Direct printing. 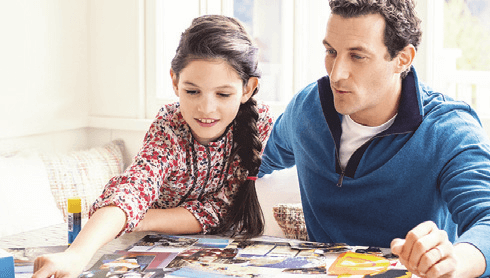 Easily print borderless, lab-quality photos, laser-quality documents, scrapbook pages from a variety of smartphones and tablets with the HP ENVY 4520. 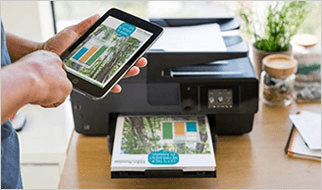 HP Smart app: The HP Smart app puts the power of your printer in the palm of your hand. Easily set up your HP ENVY 4520 printer, scan documents on the go, even print photos directly from social media and cloud storage accounts. Mobile printing: Easily print from your iPhone with AirPrint, print even without a network using Wireless Direct printing. Print speed: up to 9.5 pages/min black, up to 6.8 pages/min color. Monthly page volume: Up to 400 pages. Product dimensions: (W x D x H): 17.52 x 14.45 x 5.04 in; maximum: 17.53 x 22.22 x 5.04 in. Paper sizes supported: Letter; legal; 4 x 6 in; 5 x 7 in; 8 x 10 in; No. 10 envelopes. Display and controls: Manage your tasks directly from the 2.2-inch mono graphic touchscreen, just touch and go. 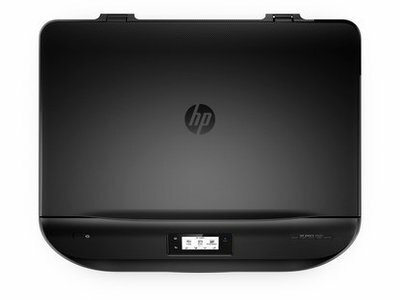 What's in the box: F0V69A HP ENVY 4520 All-in-One Printer; HP 63 Setup Black Cartridge (approx. 190 pages); HP 63 Setup Tri-color Cartridge (approx. 100 pages); Software CD; Setup Flyer; Power cord; Print guide. Original HP 63 and 63XL ink cartridges deliver authentic colors so all your prints will shine. Get up to 2x the pages with Original HP XL Ink Cartridges compared to Standard Cartridges. Do more with an affordable HP ENVY all-in-one—the perfect match for your technology. Save up to 50% on ink1 with HP Instant Ink, and enjoy the easiest way to print from your smartphone or tablet.2 Get wireless printing and lab-quality photos. Manage your all-in-one or MFP from your smartphone or tablet, using the HP All-in-One Printer Remote app. Tazz47: Wireless printer works well in BLACK, even though the test sheet printed in color the printer does NOT use color when printing forms or pictures. you are supposed to be able to switch from one mode to another but have yet to find out how. thus giving limited use. FairMindedCustomer: The double sided printing always jams and the paper tray constantly runs out of paper. You get what you buy and what you get isn't very much. The printer has the lowest reliability in any printer I've ever bought. 1 Savings claim is based on HP Instant Ink Service plan price for 12 months using all pages in plan without purchase of additional pages compared to the cost per page (“CPP”) of the majority of color inkjet printers <$399 USD, market share reported by IDC Q2 2014. CPP comparisons for standard-capacity inkjet supplies are based on estimated street price and page yield as reported by gap intelligence MFP Weekly and IJP Weekly Reports 9/20/2014. Actual savings may vary depending on number of pages actually printed per month and content of pages printed. 2 In comparison to the majority of consumer/home office inkjet all-in-one printers <$399 USD as of Nov 2014 based on market share as reported by IDC. App download required for printer setup. HP ePrint account registration may be required. Wireless operations are compatible with 2.4 GHz operations only. See hp.com/go/mobileprinting for more details. 3 Based on Internet connection to an eligible HP printer, valid credit/debit card, email address, and delivery service in your geographic area. 6 Compatible with iPhone® 4 and later, iPad® fourth generation, iPad mini™, iPad Air®, iPod® 5G using iOS 7 or later, and mobile devices using Android™ 4.0.3 or later. Features controlled may vary by mobile device operating system. For mobile scanning, device camera requires 5 megapixels or greater with autofocus capability.